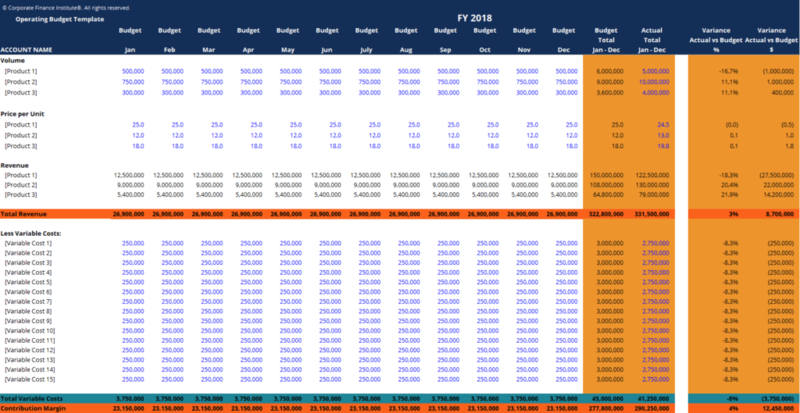 This operating budget template helps you prepare your monthly and annual revenue, costs and expenses budget. An operating budget consists of all revenuesSales RevenueSales revenue is the starting point of the income statement. Sales or revenue is the money earned from the company providing its goods or services, income and expenses over a period of time (typically a quarter or a year) which a company, government, or organization uses to plan its operations. An operating is prepared in advance of a reporting period as a goal or plan the business expects to achieve. The main components of an operations budget are outlined below. Each business is unique and every industry has its nuances, but these items are general enough to apply to most industries. Revenue is usually broken down into its drivers and components. It’s possible to forecast revenue on a year-over-yearYoY (Year over Year)YoY stands for Year over Year and is a type of financial analysis that's useful when comparing time series data. Analysts are able to deduce changes in the quantity or quality of certain business aspects with YoY analysis. In finance, investors usually compare the performance of financial instruments on basis, but usually, more detail is required by breaking revenue down into its underlying components. After revenue, variable costs are typically deduced. These costs are called “variable” because they depend on revenue, and are often calculated as a percentage of sales. After variable costs are deducted, fixed costs are usually next. These expenses do not vary as much with changes in revenue and are mostly constant, at least within the time frame of the operating budget. An operating budget often includes non-cash expensesNon Cash ExpensesNon cash expenses appear on an income statement because accounting principles require them to be recorded despite not actually being paid for with cash. The most common example of a non cash expense is depreciation, where the cost of an asset is spread out over time, such as depreciation and amortization. Non-operating expenses are those that fall below Earnings Before Interest and Taxes (EBITEBIT GuideEBIT stands for Earnings Before Interest and Taxes and is one of the last subtotals in the income statement before net income. EBIT is also sometimes referred to as operating income and is called this because it's found by deducting all operating expenses (production and non-production costs) from sales revenue.) or Operating IncomeOperating IncomeOperating Income, also referred to as operating profit or Earnings Before Interest & Taxes (EBIT), is the amount of revenue left after deducting operational direct and indirect costs. Interest expense, interest income, and other non-operational revenue sources are not considered in computing operating income. Capital costsHow to Calculate CapEx - FormulaThis guide shows how to calculate CapEx by deriving the CapEx formula from the income statement and balance sheet for use in financial modeling and analysis. To calculate capital expenditures, use depreciation on the income statement, add current period PP&E and subtract prior period PP&E are usually excluded from an operating budget. The term operating refers to a statement of operations (income statement) which does not include capital expenditures.